Don Rutherford OBE was an immaculate full back who played for Percy Park, RAF, Wasps, St Luke’s College and Northumberland during his early career. However he is most closely associated with Gloucester and Gloucestershire for whom he played from 1964 to 1968, making 94 appearances for Gloucester and captaining his club in 1967-68. He captained Gloucestershire in 1965-66. Rutherford won fourteen caps for England and toured Australia and New Zealand with the 1966 British Lions. He appeared for the Barbarians on a number of occasions between 1960 and 1968. Donald Rutherford was born in Tynemouth on 22 September 1937 and educated at Tynemouth High School. On leaving school he joined the local Percy Park Rugby Club in North Shields before completing his National Service in the RAF from 1956-58. He played for the RAF in the annual triangular inter-services tournament, toured France and Italy, and also played for Combined Services. In the 1957-58 season, while still in the RAF, he played a number of games for Wasps when his service commitments allowed. Don made his debut for Wasps against Cheltenham at Sudbury on 5 October 1957 and played his last game at Waterloo on 5 April 1958. On leaving the service and returning to Northumberland, he resumed playing for Percy Park. He had his first England trial later that year, playing for the Whites against the Colours (scrum half for the Colours in that trial was Mickey Booth). He remained in Northumberland for another eighteen months. During that time he won his first four caps for England in the 1960 Five Nations tournament and in January the following year played against South Africa at Twickenham. He also played County Championship Rugby for Northumberland. Rutherford then applied to St Luke’s College, Exeter to train as a physical education teacher. While at St Luke’s he played rugby for the college and appeared in the annual match against Loughborough College at the Old Deer Park, Richmond in 1963. Another future Gloucester captain, Keith Richardson, was playing for the opposition, who won 16-13. 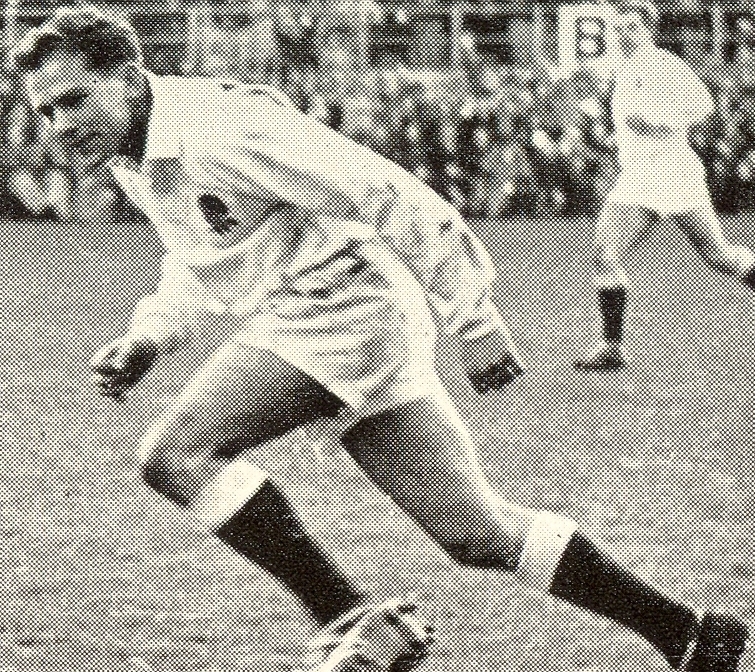 Don continued to play for Northumberland and appeared for North East Counties against the All Blacks in January 1964. In the summer of 1964, on leaving St Luke’s, Don Rutherford took a teaching post at Wycliffe College and joined Gloucester. He made his debut for Gloucester at Kingsholm, again against Waterloo, on 5 September 1964. His calm unruffled approach and genuine class impressed from the start. He was selected for Gloucestershire in November and followed this up with selection for the first of the 1965 Home Internationals. He was an ever-present for England in the Five Nations in 1964-65 and 1965-66 and was then selected to tour Australia and New Zealand with the British Lions. He made his only international appearance for the Lions against Australia in the first test but on the New Zealand leg of the tour he broke his arm playing against Manuwatu and had to be flown home. He played once more for England against New Zealand in 1967. Don Rutherford had two more successful seasons for Gloucester and Gloucestershire. He captained the club in 1967-68, playing with remarkable consistency and scoring over 300 points. Then disaster struck when he broke his arm again playing for the Barbarians against Newport in April 1968 and he was advised to retire from the game. On retiring from rugby he left behind a coaching legacy at Gloucester that was built on by his successors. Don Rutherford became Technical Director of the Rugby Union in September 1969 – their first-ever professional appointment. He returned to Kingsholm in October 1973, having assembled an international team of glittering talent to play Gloucester in their centenary game. He served as Director of Rugby at the RFU from 1969-1999 and was responsible for putting a national coaching structure in place. He was awarded the OBE in 2000 in recognition of his services to Rugby. Don, or Mr Rutherford as we called you at Wycliffe, I hope you are well and still enjoying rugby. I clearly remember lessons from you at school, both in the class room and on the Berryfield ! I was a good friend of his son at infant school and was lucky enough to be coached at a very early age by Don at Twickenham in the mid 70’s. He was a fantastic coach and the lessons I learned then stayed with me all through my time playing. Lessons which are now being passed on to the lads I coach. I hope Don that you are alive and kicking – I saw you training the England squad at Stourbridge in the 1980s. Should I be worried that the past tense is being used? You trained some extraordinary people from Wycliffe College too. I remember when “The Don” as we called him came to Kingsholm. He wasn’t really a typical Gloucester player. As I played full-back I watched him very closely. Whenever possible he used to catch the ball sideways on so that if he dropped it (very rare) it would not go forward. A player of great elegance.